Knitting in Recovery has received so many generous donations from Twist, Yarns of Intrigue that we wanted to spotlight their amazing store! Twist is based in Manhattan Beach, CA and run by Cathy Karen. Karen studied fine art in the conceptual art department at UC Irvine before realizing her love of fiber art. Karen refocused her studies and switched universities to enroll in one of the West Coast’s leading textile arts programs, and soon launched into a highly successful career in textile design and color consulting. Now she uses her 30+ years of experience in art and color consulting to run her own yarn and textile boutique. The store boasts an impressive signature line of artisan yarns that are hand-spun and hand-dyed in-house by owner Cathy. Cathy even offers dyed-to-order custom yarns. Twist also has an amazing inventory of one-of-a-kind original yarns handmade by artisans around the world. Their yarns come in a rich array of contemporary colors and fibers including organic cottons and wool, mohair, silk, cashmere, hemp, soy, and bamboo. Hand-dyed yarns on the drying rack. One of the things that makes Twist stand out is their commitment to making a difference and improving the lives of people around the world. In addition to donating to Knitting in Recovery, Twist also features a line of “yarns with conscious” made by women in Calcutta, South Africa, and Bolivia, the profits of which go back into the communities from which they came. Check out their Giving Back page to view the full list of women and organizations that Twist supports. Donations to Knitting in Recovery come from Twist (brand new yarns) as well as from customers (unused stash, leftover yarns from projects). Twist customers donate from the goodness of their hearts and receive nothing other than our thanks and heartfelt appreciation for their generosity. Many heartfelt thanks to Cathy and Twist customers for their continued support of Knitting in Recovery. 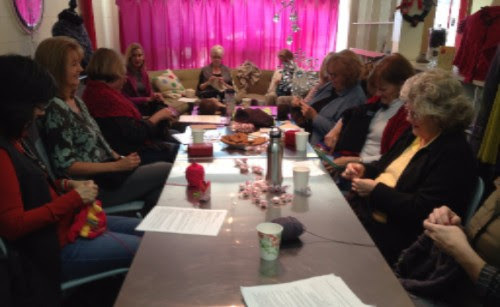 Check out Twist for your next knitting or crochet project or to join a class at Twist and meet other crafters.